NEW YORK, NY--(Marketwired - Feb 19, 2015) - Adorama (http://www.adorama.com), one of the world's largest photography, video, imaging and electronics retailers, has released a handful of new products to complement its award-winning Flashpoint accessory line. The latest releases include the Flashpoint Auto Stand (in 7' and 9' models), the Flashpoint Telescopic Reflector Holder and two new Flashpoint Flip-Flash Brackets. All items are now available with complimentary shipping. The Flashpoint Auto Stand, available in both 7' (http://www.adorama.com/FPLS7AS.html) and 9' (http://www.adorama.com/FPLS9AS.html) models, is a heavy-duty yet lightweight support with an ultra-quick setup, perfect for solo photographers carrying their own gear, as well as assistants helping with location changes. Setting up the Flashpoint Auto Stand is as simple as placing it on the ground, as the stand legs instantly extend outward. Automatically retracting legs make location changes easy and discreet -- simply lift and relocate into those tight spaces where fitting an already-extended stand is impossible, like between church pews during a wedding ceremony shoot. The 7-foot option adjusts from approximately 3.1' to 7' and folds down to 30" for storage and transport. The 9' option adjusts from approximately 3.5' to just over 9' and folds down to 40". Both options come with a reversible 5/8" stud, with a 1/4"-20 thread on one end and 3/8" on the other, which can be vertically or horizontally mounted as needed. For more information on the 7' and 9' Flashpoint Auto Stand models, please visit: http://www.adorama.com/searchsite/default.aspx?searchinfo=flashpoint+auto+stand. The Flashpoint Telescopic Reflector Holder (http://www.adorama.com/FPXBKPR01.html) is designed to hold a 5-in-1 portable reflector (such as these models from Glow: http://www.adorama.com/searchsite/default.aspx?searchinfo=glow+portable+5+in+1+reflector+kit) at any angle. Specially designed for collapsible reflectors, the holder allows users to place light-shaping accessories in any position for maximum impact. The standard 5/8" stand receiver can be connected to light stands and booms, while the ballhead design allows for quick and precise positioning and locking. With two different Flashpoint Flip-Flash Bracket models to choose from, users can be assured that their lighting quality is perfect in every situation. The first of the two options, the Flip-Flash Bracket (http://www.adorama.com/FPXBKFL01.html), has a rotating arm that positions the flash farther from the lens while staying directly above it, regardless of the camera's orientation. The second, the Rotating Camera Flip-Flash Bracket (http://www.adorama.com/FPXBKFL05.html), allows the camera to actually swivel inside of the bracket for ultimate flash manipulation. Unique to Flashpoint, both models have an integrated anti-twist plate on the platform that the camera rests on, to prevent the camera from twisting off axis during swivel motions. Both Flashpoint brackets allow users to smoothly rotate flash and SLR cameras up to 90 degrees for vertical and horizontal shots while eliminating red-eye and side shadows. The speedlight flash support arm is designed with a 180-degree range of travel for creative flash effects. With a lightweight aluminum frame and a comfortable foam grip, both brackets are easy to hold in heavy use and at rest between shots, giving users the most control possible. All new Flashpoint models are now available for purchase through Adorama's official website, or at the Adorama Superstore, located at 42 West 18th Street in New York City. 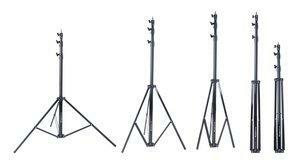 The Flashpoint Auto Stands each retail at 49.95 USD (7' model) and 69.95 USD (9' model) -- after a $10 instant rebate. The Flashpoint Telescopic Reflector Holder retails at 39.95 USD. The Flashpoint Flip-Flash Bracket retails at 19.95 USD, and the Rotating Camera Flip-Flash Bracket retails at 29.95 USD. For additional pricing information, or to explore other exciting camera accessory options from Adorama, please visit www.adorama.com.